New Table Top Single Station Tablet Presses TDP1.5. Table top tablet presses which can produce up to approx 4,700 tablets per hour depending on size of tablet and product. Maximum tablet diameter: 12mm, Maximum tablet depth: 12mm, Maximum Pressure: 1.5 Tons. 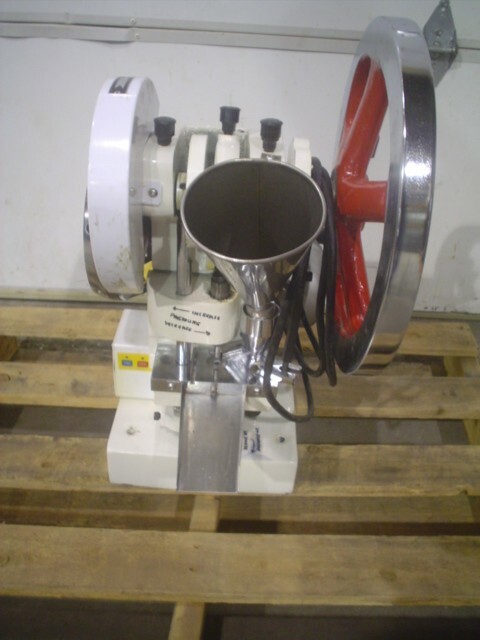 Unit comes with a Stainless Steel product hopper and shoe assembly and 1 set of tooling. Equipped with a 1/3 HP, 1Ph/60Hz/110V drive, 1,400 rpm. Overall dimensions: 23” x 15” x 25”. Weight: 200Lbs. Delivery Time: approx 3-4 weeks.